I want to give you a way to filter a repeating table with the help of a drop down. Let’s say you have a list with with a column called Requests and one column that is called Defects. You could have multiple defects for a request and now you only want to show thoose defects for the request you have choosen. First add a data connection to receive these three columns from your list. On your form, add a drop down and configure it like this. Now add this secondary data source as a repeating table to your form and delete those columns you don’t need to show in the form. Deleting them from the form doesn’t mean that you delete them from the data source, they will still be there if you need them. Afterwards it could look like this. Let us add the rule to the repeating table that will do the trick. Highlight the repeating table and click the button Manage rules in the ribbon. Add a new Formatting rule that looks like this. The condition says: When”Request” in the secondary data source “is not equal to” the “MainRequest” in the main data source. Now when you test the form you will be able to see only those defects that belongs to the request you choose. I will show you how to add a button to a repeating table and be able to copy information from that row to other fields. 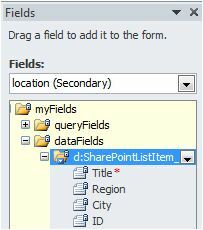 Create a list in SharePoint and name it Location with three columns, Title, Region and City. Add a data connection to your form to receive information from this list in SharePoint. Now when you have your repeating table as a secondary source, highlight it and drag it to your form. Put your cursor somewhere in the column for ID, right click and choose Delete – Columns, now you only have the Title, Region and City columns left. Now put the cursor somewhere in the City column, right click and choose Insert – Columns to the right. Now add a button in the field next to the City field. Add three Text Box fields somewhere in your form and name them MyTitle, MyRegion and MyCity. 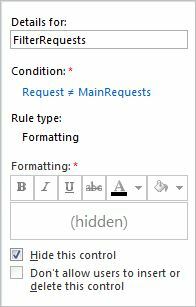 Highlight the button and click Manage Rules in the ribbon. Create a new Action rule to set a field’s value. It should look like this. The Value is built by adding the function current(), then a slash “/” and lastly, add the field Title from your secondary source Location. 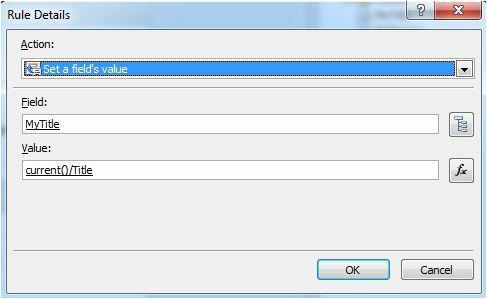 Repeat this step twice so that you get a value for each of your three fields. You should now have three actions in your rule, like this. That’s it, this is how it could look.